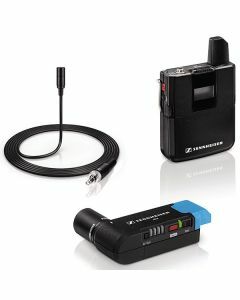 The Sennheiser AVX-ME2 lavalier digital wireless microphone set is a bodypack transmitter and lavalier microphone ideal for hands-free interview and documentary situations. Its receiver plugs directly into a camera's XLR audio input, the included adapter allows for 1/8" connection too. Additionally, the AVX-ME2 requires virtually no set-up. It makes little sense to shoot in HD or 4K in search of the best quality picture while compromising shots with audio cabling. With 1.9GHz digital wireless operation, Sennheiser's AVX-ME2 set stays well out of range of signal transmissions that typically flood other frequency ranges. This helps to protect the AVX-ME2 from signal dropouts and interference. Simply connect the receiver directly to your camera's XLR input, and press the pair button to start recording. The majority of professional cameras have an XLR input that also provides phantom power, so the AVX-ME2 powers up and down automatically when it detects a phantom current, saving valuable battery power during recording. Other camera mounted attachments can feature as part of the AVX-ME2’s set up too, the AVX receiver rotates to accommodate surrounding attachments. It doesn’t get more convenient.